Whether big or small, interiors that are styled beautifully are enough to alter the feel of a room. They can reflect your true persona, giving away every minute detail of your personality. Therefore it is worth exploring the top decorating trends that are going to inspire huge number of people. These decorating trends are simple, elegant, inspiring, chic and fortunately do not require a complete room overhaul. Sunny and brightly decorated rooms are trending again. From dark mustard to pale butters, cheerful colors are making their presence everywhere. Not just yellows, but greens are also in rage. Deep emerald and grass green are not going anywhere. You can give your living room a piece of enchanting décor. Dazzling windows with fresh curtains in the shade of yellow and green will surely impress your family members along with your guests. Inspire your senses in more than one way with the royal shade of blue. The color blue can create miracle if you allow it to, as nothing accentuates a room if you are need to add drama. The color is sophisticated plus carries a not-so-serious look. 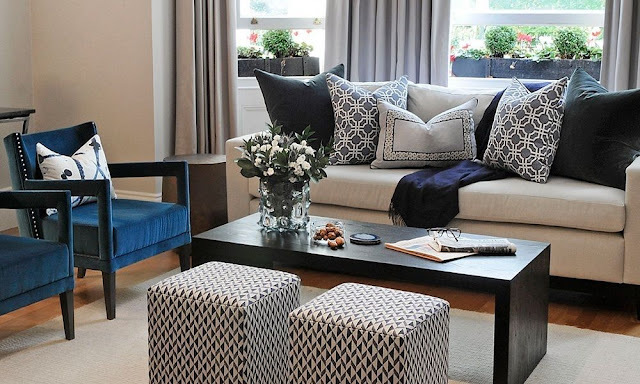 You can add blue pillow or cushion covers in your living room to give your space a cohesive look. If your style is more traditional or contemporary, olive green might be the correct move. Many find this color as dark as well as dingy, but take a closer look at it and you will notice the sophistication that is ideal for elegant abodes. You can take this shade to your bedroom and give it a fresh appeal. Pick bed linens or bed-in-a-bag to make your room look calm and serene. With a duvet or comforter either in matching or contrasting shade, you can create an inviting and organized ambience. If you walls are painted with pastel or white shade, then this color will accent your interiors even more. This will lend a calm and peaceful look to your bed room. 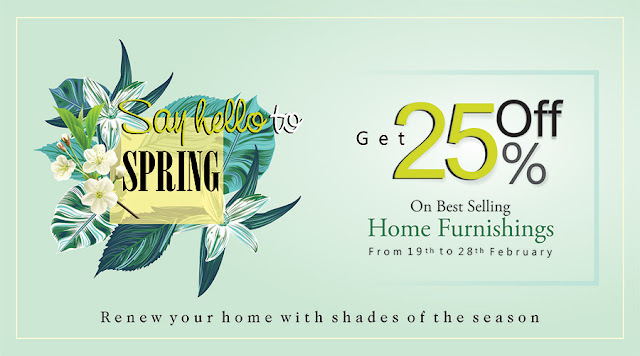 Homedrape is celebrating spring summer bonanza with Flat 25% off on all the merchandize. You can discover which and what home furnishing item will work well for your room interiors. Celebrate the wonderful colors that are making headlines for their majestic appeal. Summer is officially here and I really hope that you all are enjoying the beauty of this season. Now when it has begun to get hot outside, it is understood we all would like to spend our time indoors in our cool rooms. So how can you make your sofa or bed look graciously stunning and comfortable? Do you often check out the magazines and sigh in admiration when you see a beautifully organized sofa? Well, now you too can achieve that look in your home and the good news that it does not require you to get a degree from design school. You can have the prettiest pillow collection at your home by just using little creative instinct of yours. Although there are many ways to arrange cushions or pillows on a couch, but the most classic and eye-appealing arrangements is the five cushion arrangement. Treat your couch or sofa like a blank canvas so if you sofa is in a neutral color, chances are that you can experiment more with it. Start with draping 2 large square pillows with a bright shade as it brings some fresh and cheerful look to your interiors. Now add two more pillows and keep them in a neutral shade with some chic texture. It will blend well with rest of the home décor. Now take one rectangle shaped pillow in an envelope style and choose something in pastel and light shade. Or if you want it to be the statement piece of your living room you can choose a bold or neon shade that will highlight your living space. Voila! Your room is ready to take on even the most finicky guest, who is going to love your color combination in pillow arrangement.